It IS easy to love those who are in our camp, who love us and support our view. Those who rally around us telling us what we want to hear even when we may be dead wrong. 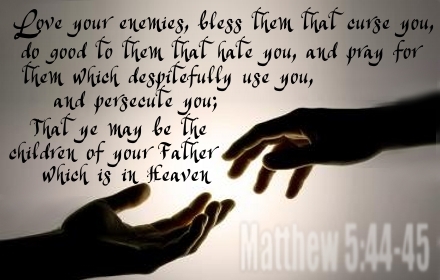 But when it comes to loving those who do not like us, maybe hate us, speak evil and unkind words about us…those we’d consider enemies. Well that is a much more difficult task. Seemingly impossible, and maybe it IS within our own strength. But then nothing we do is to be in our own power, it is from God that we find the ability to forgive and let go of grudges. I know, I’ve been there. For several years I had harbored bitterness in my heart. And bitterness takes root and if you’ve ever tried to kill weeds you know how tough that can be to remove them for good! But I also knew it was what I had too do. Once I released the hold I had on that bitterness, and yes you read that right, I had hold of it, I was the one not letting go, it died. An emotion only has power over us if we hang onto it, nurture it and help it grow. Every time an unkind thought came into my mind toward the persons I felt bitter, I would refuse to think it, and replaced it with a positive one. Don’t misunderstand, it wasn’t and some days still isn’t always easy to pray for an enemy or someone who has hurt me. When I reach out and try to extend an olive branch and it is shot down, it is very difficult not to go on the defense and lash out. Sometimes I do trip over the issue and post or say unkind things. But this work in progress manages to let God’s spirit speak to my heart and I again try to right the wrong. So, I keep praying for my enemies, and love them from a distance. No matter what they do or say, they cannot stop me from doing this, and in the end it isn’t really about them. They will answer for what they do, I have to worry about answering for what I do.